As many of you may have noticed, I have a weakness when it comes to surfboard fins. I’m always looking for that magical fin set-up that will move my surfing to the next level. This time, I may have discovered the ultimate 2+1 fin set. Manufactured by Shaper’s Fins in Australia, and distributed by Block Surf here in Ventura County, these fins are made using state-of-the-art composite construction. The fins pictured above have a honeycomb foam core, with carbon fiber base and leading edge. The trailing rear-half is fiber glass. 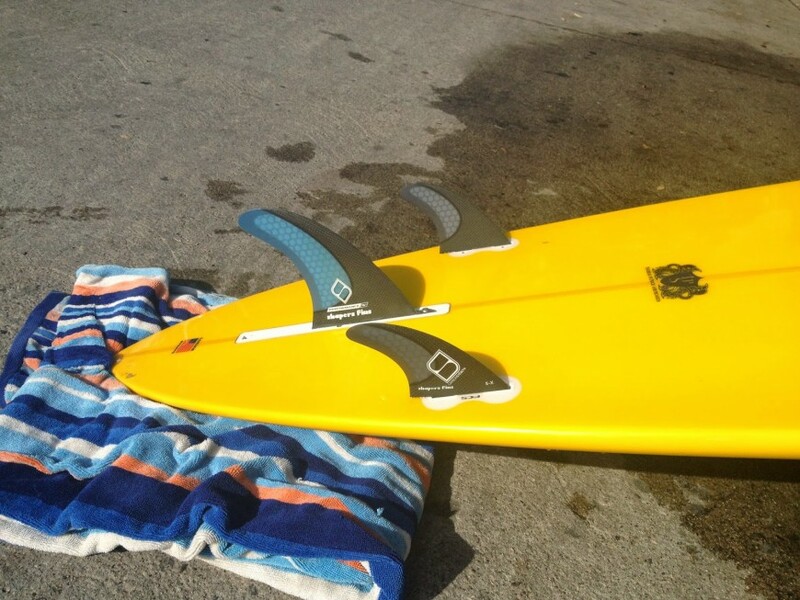 Shaper’s calls these fins “Carbon Stealth”. The end result is a light fin that has a variable flex pattern from base to tip, and from front to back. Surfing these fin in slightly overhead conditions at my local point break, I was amazed by how smooth and fluid my turns felt, but with more than enough drive and hold. I was so impressed with the performance of these fins that I ordered a quad-keel set for my new 7-3 Widget (big brother of the Mini-Widget) I shaped that board last week and now its waiting its turn at the glasser’s.